Looking into the eyepieces of this iconic set of tourist binoculars transports the viewer from the facility floor in San Francisco's Golden Gate Park out to a commanding location on the Farallon Islands. Miles off the coast and closed to the public, the islands come to life in the viewer. A high-resolution spherical panoramic image is presented by having the view slaved to the tilting and rotation of the viewer. This piece was commissioned by the California Academy of Science. The work was done at Onomy Labs, and we had cooperation from the Tower Optical Corporation, who make the classic viewer hardware (here stripped of its traditional optical innards and transformed with sensors and a heads-up display). Not only does the exhibit transport people to another place and/or time, if offers other powerful capabilities. For the Farallon version at CAS, we embedded a couple dozen hot spots into the landscape, depicted by special icons. When those icons are centered in the device's field-of-view, they expand and show a brief video. For instance, an icon of Elephant Seals would play a 10-second video of them on the island, and an internal speaker plays audio that goes with the video clip. 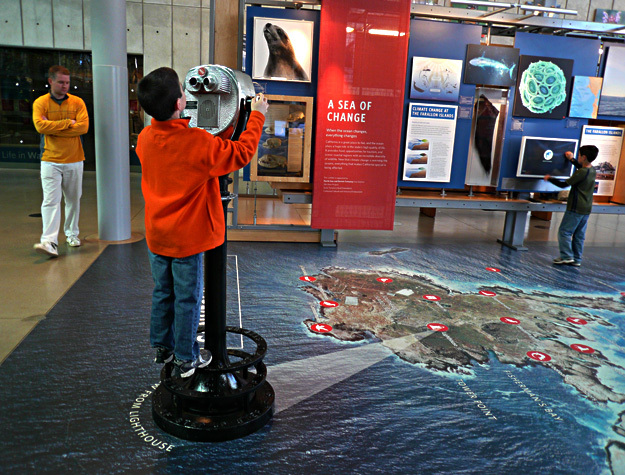 The experience is very engaging – it's one of the most popular exhibits in the whole facility.